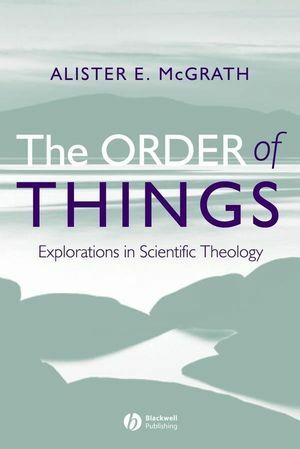 Provocative and immensely well informed, The Order of Things represents a substantial and original contribution to the fields of systematic theology, historical theology, and the science and religion dialogue. Leading theologian, Alister E. McGrath explores how the working methods and assumptions of the natural sciences can be used to inform and stimulate systematic theology. Supported by a published review of McGrath’s scientific theology project, which is currently the best brief introduction to his thought. Alister E. McGrath is Professor of Historical Theology at Oxford University. He earned his D.Phil. from Oxford for research in molecular biophysics, and his D.D. for research in historical and systematic theology. He is the author of numerous bestselling textbooks and also the acclaimed Scientific Theology trilogy: Nature, Reality, and Theory (2001-3). Renewing the Quest for Reliable Knowledge. On Developing a Scientific Theology. 1. Alister McGrath's Scientific Theology. A review Article by Dr Benjamin Myers, University of Queensland. 2. Is a "Scientific Theology" Intellectual Nonsense? Engaging with Richard Dawkins. The Universal Scope of the Natural Sciences. Darwinism and the Impossibility of Theology. Faith and Evidence in Science and Theology. Theology as a Virus of the Mind?. Does Theology Impoverish Our View of the Universe?. 3. A University Sermon: On Natural Theology. 4. Towards the Restatement and Renewal of a Natural Theology: A Dialogue with the Classic English Tradition. Natural Theology: an Autobiographical Reflection. The Golden Age of English Natural Theology. The Boyle Lectures and the Problem of Heterodoxy. William Paley and the Divine Watchmaker. The Challenge of Darwinism for Natural Theology. Incarnation, Trinity, and Natural Theology. Responding to Karl Barth: Natural Theology as a Specifically Christian Undertaking. Tradition, Interpretation and the Discovery of God : Natural Theology and Meno's Paradox. Cognitive and perceptual approaches to Natural Theology. 5. Stratification: Levels of Reality and the Limits of Reductionism. Stratification, Emergence, and the Failure of Reductionism. Mathesis Universalis: Heinrich Scholz and the Flawed Quest for Methodological Uniformity. 6. The Evolution of Doctrine? A Critical Examination of the Theological Validity of Biological Models of Doctrinal Development. Nature as a Source of Theological Models. The Notion of Doctrinal Development. "Universal Darwinism" and the Development of Culture. Are Human Ideas and Values Outside the Darwinian Paradigm?. Darwinianism, Lamarckianism, or What? The Indeterminate Mechanism of Cultural Evolution. Cultural Evolution: an Historical Case Study. Directing Evolution: Antonio Gramsci and the Manipulation of Cultural Development. The Memetic Approach to Intellectual Evolution. Doctrinal Development: are there Islands of Theological Stability?. Contingency, History and Adaptation in the Evolutionary Process. Contingency, History and Adaptation in the Development of Doctrine. Chalcedon, Metaphysics, and Spandrels: Evolutionary Perspectives on the Chalcedonian Definition of Faith. 7. Assimilation in the Development of Doctrine: The Theological Significance of Jean Piaget. Assimilation to Jewish Religious Norms: Ebionitism. Assimilation to Roman Cultural Norms: Pelagianism. Assimilation to Anglo-Saxon Cultural Norms: Christ as Hero. The Achievement of Equilibration: Factors Encouraging Theological Accommodation. 8. A Working Paper: The Ordering of the World in a Scientific Theology. 9. A working Paper: Iterative Procedures and Closure in Systematic Theology. 10. The Church as the Starting Point for a Scientific Dogmatics. Starting from the Visible Reality of the Church. Can Theology be Empirical? John Locke versus John Dewey. The church as an Empirical Social Reality. Stanley Hauerwas on Seeing the Church. Transignification and Transvaluation: the Church and New Ways of Sseeing Things.